Michael Kopech made his rain-shortened major-league debut on August 21 against the Minnesota Twins. Lucas Giolito (10-9, 5.66 ERA) was dominant last night allowing just one earned run in 6 1/3 innings. Then they played the rest of the game. With a 4-0 lead after six innings, the Chicago White Sox (53-81, .396) had the best team in baseball backed into a corner. The Boston Red Sox (93-42, .689) scored four in the seventh inning and five in the ninth to win their 93rd game of the season. The Red Sox are now 51 games over .500 and hold an 8 1/2-game lead over the New York Yankees (84-50, .627). For the second game of a four-game series, the Red Sox will send 28-year-old Nathan Eovaldi (5-6, 4.15 ERA) to the mound. Eovaldi dropped his last two starts against the Cleveland Indians (76-57, .571) and Tampa Bay Rays (71-62, .534) allowing four and five earned runs respectively. The deepest he's pitched in a game this season was against the Yankees on June 15 when he lasted 7 1/3 innings. Tonight, the White Sox will answer with their 22-year-old phenom, Michael Kopech (1-0, 1.13 ERA). 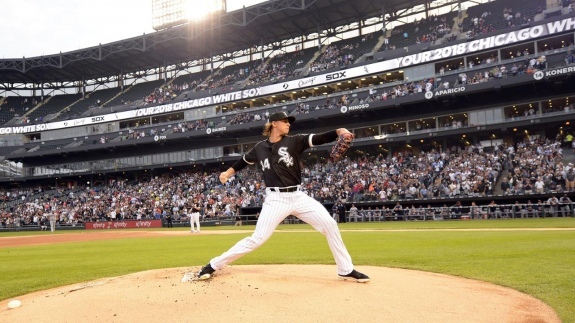 Kopech made his major-league debut on August 21 against the Minnesota Twins (62-71, .466). During that start he allowed three hits and fanned four Twins in two innings, but a rain delay ended his evening early. He lasted six innings against the Detroit Tigers (54-80, .403) on August 26 and allowed one earned run and fanning four. Fun Fact #1: The last time I watched the Red Sox play live was on September 25, 2011, at Yankee Stadium. We were in attendance for the first game of a doubleheader against the Yankees. Yankees catcher Jorge Posada was 2-for-3 with a home run and two runs batted in. Fun Fact #2: More than 30 years have passed since I've seen the Red Sox and White Sox play each other. On July 8, 1988, I was in attendance as the teams split a doubleheader at old Comiskey Park. The White Sox won the first game, 6-5. White Sox designated hitter Harold Baines was 3-for-4 with three runs batted in. The Red Sox won the second game 10-7. Red Sox center fielder Ellis Burks was 2-for-4 with two home runs and four runs batted in.